One of ACES’ customers called with a curious issue: They were an aerospace company using an older vacuum furnace to anneal stainless steel parts, making them shiny and silver — but now the parts were coming out green. A Control Systems Inspector (CSI) was dispatched to the site to investigate. It’s widely recognized that in a vacuum situation the color of the end product can be affected by contaminants during the annealing process. Green is an indicator of moisture in the vacuum, so the CSI began to leak-check the furnace using a helium mass spectrometer. He hooked the device up to the roughing pump of the furnace and began to spray helium at strategic points on the furnace exterior. Since the helium molecule is extremely small, it’s easily sucked into any vacuum leak, travels through the system and triggers the helium leak detector on the system exhaust. The CSI started at the top and worked his way down all the main fittings and connections. He discovered a significant leak on the door seal and replaced that seal. He also drained and pressurized the heat exchanger and water jacket, tested them, and found them in fine working order. Oily buildup can trap contaminants that outgas during the cycle and affect the overall vacuum quality. 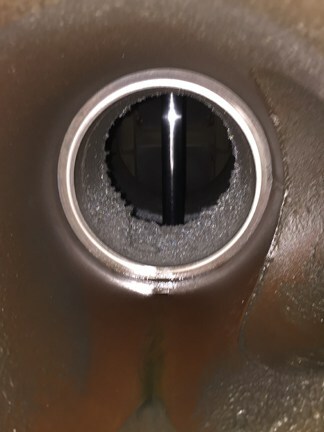 However, while removing the water from the heat exchanger he noticed an extraordinary amount of water in the air line, indicating a possible leak on the poppet valve cylinder seal or the main valve. This raised a suspicion of a leak in one or more of the air-operated valves. Another detail pointing to the valves was the age of this vacuum furnace, which was installed in the early 80’s and utilized ambient shop air to operate the valves. Newer systems use an inert gas such as nitrogen or argon to operate valves — to prevent precisely this kind of contamination in the event of a seal leak. When the CSI opened the main valve, water blew out of the manifold, and he also observed an oily residue in the main valve body. When he tested the valve cylinder rod seals with helium, the leak rate increased. He ascertained that the roughing valve was also leaking. Once the leaking valves were replaced, the test part came out clean and bright, with no tinge of green contamination. The CSI pulled both the main valve and the roughing valve and replaced the seals in both cylinders. 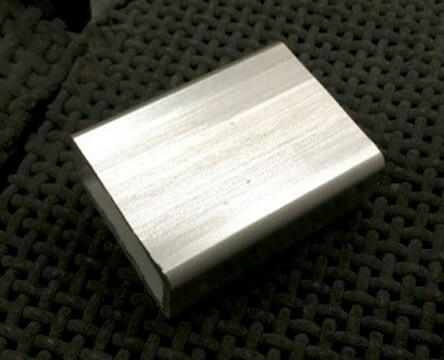 He ran a test piece of stainless steel and the result was a shiny silver part, with no discoloration or contamination. The CSI made a recommendation to the customer that they upgrade the pneumatic controls of their furnace to be powered by an inert gas, taking advantage of the existing nitrogen line already in use for nitrogen quenching. This would prevent future green parts contaminated by trace amounts of moisture in the shop air. Are your production parts coming out green, brown or any other color of the rainbow? ACES technicians and engineers are experienced troubleshooters, who will track down issues and have you turning out perfect products in no time. Give us a call today for a free estimate.